With so little British television watched in America, at least knowingly, it often seems more important to be an ambassador than a critic. However, some British programmes make that act of intercultural liaison a difficult proposition and it doesn’t help that in particular cases the American equivalents are far better. Now in its third season on CBS, Elementary is an updatation of Arthur Conan Doyle’s Sherlock Holmes stories transferred from London to New York and in keeping with the conventions of the police procedural. Given the timing of its arrival and modern-day take on the Holmes mythos, Elementary could be thought of as an American remake of the BBC’s Sherlock. To my mind, though, the latter has simply served to make the former completely irrelevant. Really, you don’t expect the American version of a British TV series to be more progressive and edgier and yet Elementary is the series in which Watson is an ethnic woman and Holmes is a recovering drug addict. 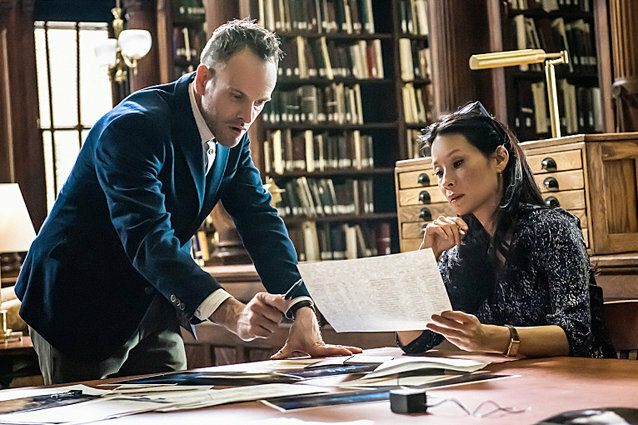 While Sherlock is groping around in the annals of fan fiction desperately searching for storylines, Elementary offers concrete mysteries week-after-week. Elementary stands confidently in the generic traditions and weekly nature of television but Sherlock seems to be constantly pushing against the logic of TV flow. The supporting characters in Sherlock are severely underdeveloped and generally passed off as morons that reaffirm Holmes’ superior intelligence. Elementary’s ensemble cast is full of fleshed out, complex and relevant characters providing a different perspective on Holmes’ investigations that frequently proves crucial. Sherlock is surrounded by an incredible fandom than feeds off itself as the series incorporates and invites cult audience activities in its name. As such, the writing is often problematic or inept from a story viewpoint, since it must always gesture to this extra layer of self-gratification. Conversely, Elementary makes the mechanics of plot its priority rather than the relationship between Holmes and Watson, which seems to pique the interest of Sherlock fans. 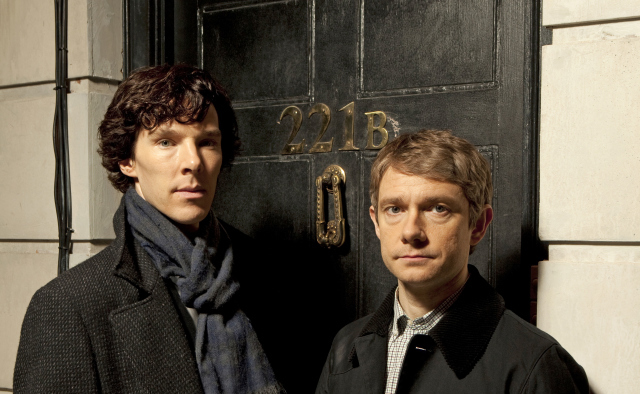 Characters and their dynamics emerge as the storylines advance, and the series never takes the re-gendering of Watson as a cue to slash fiction romance. In doing so, the scripts achieve the rare balance of Conan Doyle’s storytelling where character and plot are equally stimulating, yet neither yields power over the other. In light of Elementary, I no longer have anything good to say about Sherlock. I can certainly see the attraction to American viewers, as the former homogeneously blends into network primetime programming while the latter seems to defy those very conventions. I daresay this is probably why Top Gear is so popular here, because the American equivalent would be so bland and corporate in comparison. Yet a more informed and less ignorant version of Top Gear is no bad thing, and does more justice to the matter in hand than a faux-sitcom peppered with cultural insensitivity. I suspect the curiosity of Sherlock is what blinds viewers here (British viewers you have no excuse!) to the fact that there’s a more interesting adaptation in their backyard. It’s also a matter of salesmanship. Sherlock showrunner Steven Moffat like to write in a way that aims to convince you of the quality of what you’re witnessing in the hope you will ignore the lack of basic competence in the craft. Success is measured in the same way it would be for an ad campaign rather than an individual artwork. It’s hard not to be impressed or enticed by television that is so convinced of its own transcendence. Elementary is rather more discreet in self-estimation and should be judged over time. Regardless of calibre, most imported British dramas make it on to American screens through the PBS Masterpiece strand, which automatically bestows worthiness upon them in ways that Thursday night on CBS does not. There’s so much British television that beats America hands-down, especially the regular kind, but the case of Sherlock and Elementary suggests we cannot make broad assumptions about the inherent superiority of British television. Whatever promise of distinction Sherlock offers to American viewers does not conceal its dysfunction as drama and Elementary is not to be confused with the swathes of mediocre procedural television that surrounds it. I want American audiences to buy into the alternative appeal of British TV, but as someone who cares about quality I’m wary of advocating programmes that offer nothing but a sideways look, especially when there’s stronger material in even their most elemental of programming. I can’t help think that only British TV will suffer if America fetishizes our worst. Changes to Network: The channel ident will have to be changed. Instead of celestial white letters burning transcendently out of the white noise of a TV screen against the sound of a heavenly choir, there will be a pixelating logo of a limp hot dog on a pirated DVD menu (with only a ‘Play Movie’ option) for a 90s thriller starring Ice Cube and the sound of a trucker dumping audible in the background. Marketing Strategy: Subscription free with any Slurpie. Changes to Network: The network will commission a new Law & Order spin-off called ‘State Torture Victims Unit’. They will also develop a home-cooking themed reality show called ‘Guess Who’s Coming to Ahmaddinejad?’ in which the Iranian President drops by to share the evening meals of families across America. Marketing Strategy: Sell original programmes to a rival network until they become hit shows on the other channel and that network starts to make its own original programming. At this time the network president will appear in public denouncing the rival network’s original programmes and demand that they cancel them. If this strategy fails the network will threaten their rival with a ratings war by putting on all-day back-to-back re-runs of Two and a Half Men. Changes to Network: Bert and Ernie will need to be evicted from Sesame Street in accordance with network president Romney’s views on gay marriage. Downton Abbey will be pulled and replaced by Downtown Antimony, a historical drama about the Utah metal mining industry. Marketing Strategy: Instead of telethons, funding for the network will come from Super Pacs and rather than a free tote bag, viewers will receive a visit from a Mormon minister, whether they contribute money to the network or not. Changes to Network: Reporters will now do their segments to camera indoors standing in front of the draft from a dehumidifier for dramatic effect. Al Roker’s ‘look at the weather where you are’ will become a close-up of a thermostat. Marketing Strategy: Are you kidding me? How the hell do you market weather anyway? Marketing Strategy: Anchors will no longer have to pretend that they don’t agree with everything Karl Rove says or concede to statistical facts like election victories. Otherwise, on message. Changes to Network: To compliment the feeling of burning in hell forever original movies will run continuously on a loop without episodes of Frasier to break up the torture. Dance Moms will have a themed episode in which the students re-create the Thriller video and Abby Miller, hopefully, decomposes. Marketing Strategy: Re-tool all original reality shows to include death. One Born Every Minute gains a sister programme called Make Way for Babies in which new parents have to decide on an old person to kill in order to balance the population. The Week the Women Went takes on a darker aspect as it becomes clear they’re not coming back. Though lacking the cache of original series shown on subscription channels HBO and Showtime, cable network FX has been home to many highly sophisticated, niche-taste TV dramas over the past decade such as The Shield and Sons of Anarchy. Recently there’s been an attempt to put their comedy in the same league. Carrying the banner is Louie, comedian Louie C.K.’s auteur sitcom, a show so completely devoid of story it makes Seinfeld look like a murder mystery. Opening with the most remarkably unremarkable title sequence in the history of television, each episode is a Venn diagram interlocking a seemingly aimless pair of vignettes which unfold at a quotidian pace and usually defy closure or resolution. I hit it on a brilliantly gag-heavy episode (the one with ‘palp’ for those in the know) but I can imagine it being extremely tough to get into on one of those occasions that it decides not to have a joke in it or turns the table and makes the joke that there isn’t a joke. But what is truly revolutionary about Louie is the visual imagination it brings to sitcom-a way of putting forward observation and emotion in the form of images and letting direction carry the comedy. While Louie attracts a hipster crowd by virtue of it sometimes paralleling a Richard Linklater movie and its brushing against (though also routinely mocking) urban cool, Elijah Wood star vehicle Wilfred is a cynical pander for an indie movie audience. It’s one of those sitcoms that is all concept-a man lives with a dog played by a man in a dog costume-without regards to how it flows week-to-week. To me, the difference betweenthis and a show-that-writes-itself like ALF is purely cosmetic. Just because stylistically it seems like something that would be in a Wes Anderson or Michel Gondry film doesn’t mean it’s interesting, just that it knows its demographic. Remember when I used to star in movies with CGI? Launched in the late 1960s as a publicly-funded alternative to the network system, PBS frequently looks to the public service broadcasting in Britain-represented by the flagship British Broadcasting Corporation– as a mentor but also as a reliable source of programming. A number of US sitcoms like The Simpsons and King of the Hill have derived humour from the gap between the classy image of British television and the lowbrow British sitcoms shown on PBS which seem to tell a different story. This seems borne out by the popularity of Keeping up Appearances in the US, a farce about a working-class woman who effaces her past by moving to the suburbs but then repeatedly gets dragged back to her former life. As a window on British culture for Americans, it says a great deal about how class-obsessed we (still) are as a nation. It also presents a more rounded image of British life than most Americans know, one that includes the working classes and the poor, and with characters that resemble trailer trash and welfare slob stereotypes in the US. Despite this it’s a monotonous, catchphrasey affair where the jokes usually involve a woman falling over showing her bloomers. And thus it doesn’t say much for the nation’s tastes. 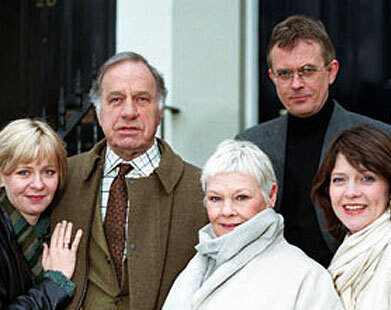 Another favourite of PBS Sundays is As Time Goes By, a gentle and solid middle-aged love story distinguished by the calibre of its stars; British character actor extraordinaire Geoffrey Palmer and international film star Judy Dench. In contrast to Keeping up Appearances, it actually suggests that we’re rather good at crafting sitcoms and that the quality of British acting (even in a middle-of-the-road sitcom) is as good as the Americans would myth it. But it’s detrimental to the image of our country in the way it reinforces the idea that we’re a land that time forgot composed entirely of the upper middle-classes and the gentry (with an underclass of poachers who live in the woods). G and I were watching an episode from about 1992 and it was difficult to convince her that it was twenty years old. With sitcoms like this to go on, I imagine many Americans think we’re Brigadoon. Laura: You’re a good man who makes bad puns. Rob: I do not make bad puns. Now pass me the nutcracker, sweet. Not even the hauntingly videographic commercials about botched vaginal mesh surgery could tear me away from writing that good. No wonder Americans think we still live in castles. Thanks to one of Britain’s most popular TV exports to America, the nation would be forgiven for assuming that the downtown areas of our cities look like the grounds of stately homes. Being as British and American accents differ, or that we ‘have an accent’ as I’m more readily informed here, G and I’m sure others were led to believe that the ‘Downton’ in Downton Abbey was not a place but a direction. The downtowns of US cities are comparable to the restaurant, nightlife and shopping quarters of UK city centres and high streets. If it really was Downtown Abbey, Central London would be some sort of class-system role-play theme park where in order to get lunch visitors would have to adorn Edwardian clothing playing either the aristocracy or servants and compete to see which side could repress more of their pasts. 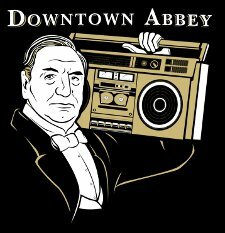 Downton is in fact the fictional Yorkshire-based setting of Julian Fellowes’ (the egg-shaped man who apologises for aristocratic misdeeds on UK talk shows) and Gareth Neame’s ITV Sunday-night period drama series Downton Abbey. It’s clear from very early on that things tend to come to Downton rather than the other way around; people, cars, war, Spanish flu. It seems that 1912 to 1919 in British history was just people arriving at doors. Unlike most geographically-fixed locations for TV shows, like Jersey Shore,which seem able to go virtually anywhere in the world, DA probably won’t venture further than that the post office in the village where the servants receive blackmail letters. When war ‘came to Downton Abbey’ it went by so fast that it seemed to have actually been fought in the grounds of the building, like a game of Risk gone awry. One of the most pleasing aspects of the programme is that it is unashamedly soap opera. The BBC’s adaptation of Dickens’ Bleak House in 2005 tried to show viewers how period drama could work as soap opera by flagging up similarities between serialised 19th Century novels and modern-day soaps, putting each episode on twice-weekly like Eastenders or Coronation Street. DAonly runs at 8 or 9 episodes per season but its eccentric storylines delivered in intimate conversations between paired characters which then cyclically wind around a single location like a tape spool leave a distinctly soapy residue. It seems it’s not just the form but the content of soap opera that works in period costume. G likens DA to the ‘Telenovela’, continuing dramas on TV in Latin American countries which have much of the melodrama and contrivance of soaps but have shorter runs that end definitively. For lovers of classic British TV, movies and books there’s not much new here. At times it feels like an infomercial for a Greatest Hits album of historical great house stories-isn’t this Upstairs Downstairs?-that’s just Mrs Danvers from Rebecca-didn’t they do that in Brideshead Revisited?-but not available in the shops, just illegal download in the US. For many in America, however, DA seemed new and different. Maybe it was the absence of a certain stuffiness in British period drama that can be off-putting to lay viewers. DA in contrast is jokey, emotionally engaging and accessible. Perhaps it taps into the same demand for stories of wealth and status that brought Dallas back to TV, with added topical pleasures of seeing the rich dragged into the mud of reality through war, inter-class marriage and scandal. Or could it be that Americans are more comfortable with us as things of the past? Whatever the source of DA’s appeal, it has a novelty currency in the US that British TV viewers wouldn’t necessarily see. Sunday-night, period-set serials are ten-a-penny/a dime-a-dozen (delete as appropriate) in the UK and I’d say Downton Abbey succeeds by virtue of the quality of its performances, dialogue and loving ridiculousness of storyline which sets it apart from never-classic fare like 60s-set rural emergency services dramas Heartbeat and The Royal. Propping up the first two qualities with a cane she’d-use-if-she-had-to is Maggie Smith’s Dowager Countess. Maggie may be bribing the script editor as she’s been given enough witticisms, barbs, jibes, punchlines and put-downs to make Groucho Marx seem politely reserved, delivering them with a ‘who me’ innocence that befits the roundest eyes in showbusiness. As a measure of the third there is Bates (Brendan Coyle), the unluckiest man to have lived in the existence of the world, dinosaurs inclusive. With a slight shift in tone, he could be Oliver Hardy. I’m always surprised and impressed when I encounter Americans who adore Doctor Who. Surprised because it must have been such a pain to track down on TV that animosity would be a more natural response and impressed because they always seem to revere the qualities of the show that many British viewers have forgotten ever existed. But let’s go back in time. The BBC had wanted to sell Doctor Who to American television networks right from its inception. In fact, it was once touted as a replacement for CBS’ heavyweight science-fiction series The Twilight Zone. But it wasn’t until the 1970s that Americans finally got a run of the show, thanks in large part to PBS purchasing a block of Tom Baker serials. However, the series was being shifted around the schedules so regularly and so routinely butchered by editors that it became difficult to follow or enjoy. Despite these viewing challenges, a fan culture emerged around Doctor Who in the US at this time. In the 1980s, the BBC and the producers of the show started actively courting American viewers; having an American companion in the series, organising US conventions and tours, and looking to the states for money for specials e.g. The Five Doctors. When the show was cancelled in Britain in 1989, it was American television that attempted to revive it. In 1996, a TV movie starring Paul McGann was broadcast by Fox with an eye to launching an American version of the programme. Roundly regarded as a failure critically, commercially and conceptually, it nonetheless laid many of the foundations for the show’s BBC revival in 2005, not least the still sacrilegious notion of The Doctor making out with his companions, which is virulent in the re-launched version of the programme. The export of post-2005 Doctor Who to America has been more straightforwardly successful. This is thanks to popular showings on BBC America, new episodes being bought by the Sci-Fi Channel, and interminable spin-off Torchwood being co-funded by US network Starz (formerly known as Starz!). Now we are in a situation where the first two episodes of the 2011 series are co-productions with BBC America set (as far as we can tell) in the American West and involving the White House. From my own experience talking to Americans about Doctor Who it seems that the devoted cult following might have actually been consolidated by the patchy US scheduling of the series in the 1970s. As a seller in a second-hand bookshop in San Francisco said whilst handing to me a copy of Terrance Dicks’ novelisation of Terror of the Autons ‘You had to want to see it’. It’s also striking to me how much the Americans I’ve spoken to treasure the ‘classic’ series (or, more accurately, Doctor Who before 2005) and seem resistant to it being reinvented for contemporary TV viewers. ‘I can’t watch it now’ said the shopkeeper ‘it’ll spoil the memory of me and my brother staying up late to catch it’. Again, there’s a sense that the obscure scheduling of the programme was part of the pleasure but it’s also clear that viewers had great emotional investment in those 1970s serials. Others I’ve spoken to seem nonplussed by the more recent series, even when recognising its achievements. ‘Yeah, it’s a smart show’ another interested party told me ‘but I miss the big scarves and those robots with the stalks’. It’s interesting that the Americans I’ve met light up when talking about those earlier serials but talk dispassionately about the latest episodes, even when their image of the series is sharper now than it was then. It’s doubly interesting to me, as I have this ‘American’ perspective on the series too (though less so now the wonderful Matt Smith and some very capable producers and writers have taken over), and surprising as I don’t really have much of a childhood attachment to the series, it’s just my opinion gained through watching the programme as an adult. This perspective on Doctor Who seems much more sophisticated to me than that of the hoards of British viewers who were happy to jettison the show’s past and fetishise the aspects of ‘New Who’ that were completely at odds with what made it great, the worst culprit being excess of emotion. It’s natural for Britons to be protective of such a remarkable part of our national culture and want to protect it from Americanisation, but given stateside attitudes to Doctor Who in comparison to ours, I do wonder sometimes.